If your baby won’t sleep through the night, you might appreciate the fact that you’re not alone. 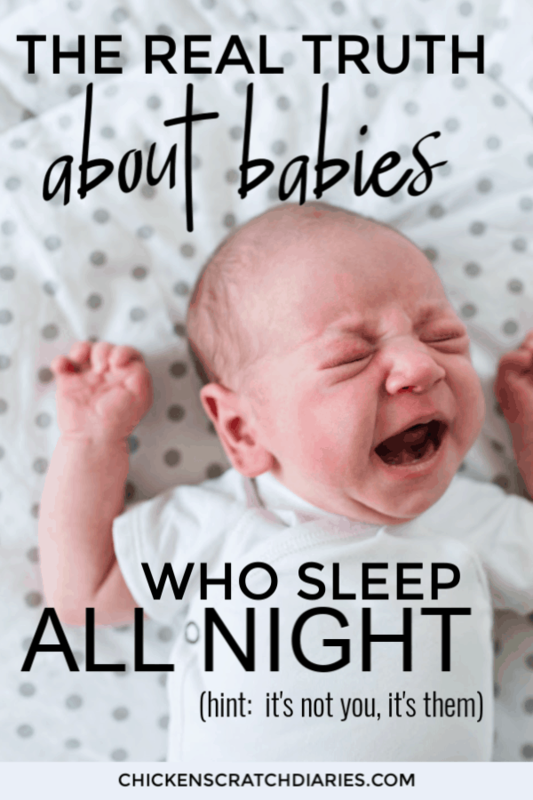 When do babies sleep through the night? I can’t tell you that for certain. I can only share my experiences. 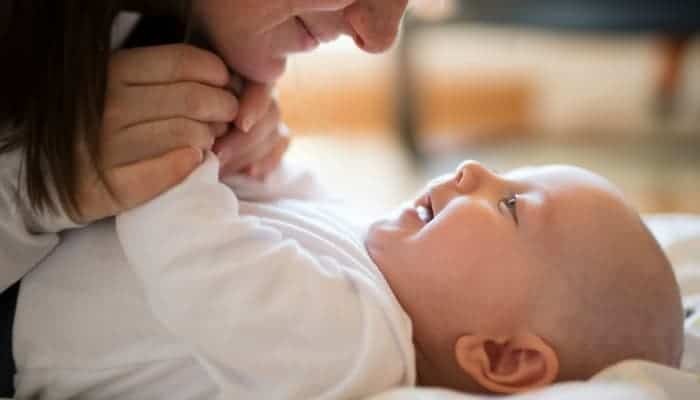 Because the fact is, how to make baby sleep is probably the #1 question parents want to know, yet the hardest question to answer with any degree of certainty. So in case you’re up at night and just need to know that someone’s in the trenches right with you, with baby fighting sleep once AGAIN – this one’s for you. In your mind’s eye, picture a serene, still, dark night. Let’s say 2:00 am. Everyone is in bed. The only sounds that can be heard are the gentle hum of the refrigerator, the irregular chirp of a lone cricket; maybe a pickup truck rumbling quietly down the highway off in the distance. Now that we’ve set the stage for your peaceful night’s rest, I want to talk about what it’s like at my house at 2 am. SPOILER ALERT: It’s nothing like what I just described above. You see, at my house, when there’s a baby around, there’s no such thing as a “silent night”. I have YET to experience this peaceful slumber for the last year, because my babies don’t sleep. In fact, not ONE of my four children slept through the night as babies (or even through half the night) until they were — wait for it — ONE YEAR old. I am not kidding. I am not looking for pity. This is, simply, my sleep-deprived reality. My babies were well-fed, happy, healthy, sweet and the embodiment of all that’s good and right about life — but they never slept at night. 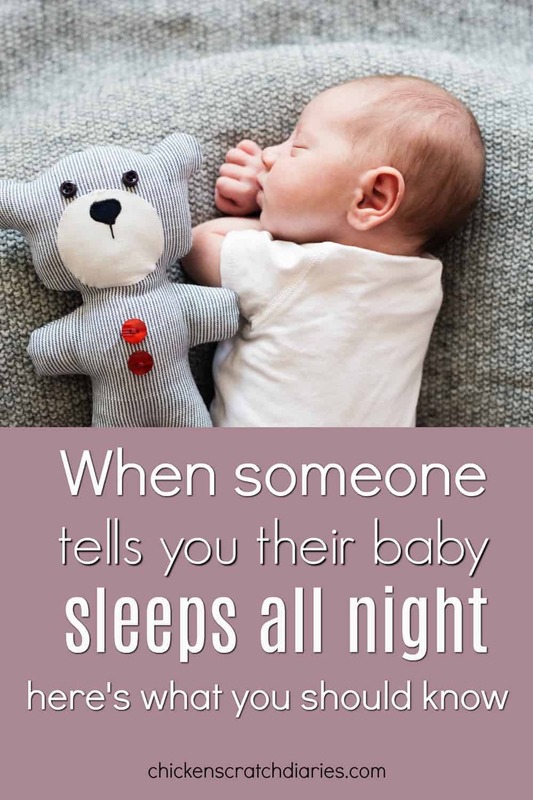 And yet, at least once a week, a friend, a co-worker, an acquaintance or random stranger at Wal-Mart will somehow mention, offhand, that their three-month-old is “finally” sleeping through the night. I’ve developed a pretty good poker face over the years, but when I hear about these mystical, go-down-without-a-fuss, sleep-for-12-hours babies, I about lose it. Where do they come from? And why do all the tips, tricks, and sleep-help books in the world not seem to have any measurable effect on my offspring during that exhausting first year? Well, I’ve figured it out, and I’m about to share the truth with you. You heard me: Sleep By Design. There’s all kinds of crazy things happening these days in the world of medical science. They’ve cloned sheep, for goodness sake. Someone discovered that classical music in utero makes kids smarter. With all these rapid advancements, I’m pretty sure that some parents are paying big bucks for the magical Sleep Gene Enhancement. In a few years, it will just be another checkbox option on the OB intake form (right next to: breastfeeding? bottle feeding?). We all know that little kids pick up the slightest whisper across the room when we’re saying something we shouldn’t — then go completely deaf when we ask them to pick up their shoes (all 48 times). I think some parents are unknowingly adapting this trait for their own survival. So the baby starts to fuss at night, and the Selective Parental Deafness (SPD) just kicks in. They don’t even hear the baby. The baby then also has to adapt by fixing his own bottle and finding his own favorite Netflix shows to put himself back to sleep. Mom is never the wiser. Post-Traumatic Sleep Disorder. This is usually brought on by intense, prolonged periods of not sleeping for more than three consecutive hours for months (or years) on end. Can be related to having a nursing baby that thinks you’re an open-24-hours diner. Days turn into nights and nights become a blur of wishful thinking. When asked how the baby’s sleeping, you get a sort of blank stare from these poor moms. They really aren’t even sure what day it is. You know, the parents that say their baby was rolling over on day 2 and walking at 6 months? Uh-huh. I think this type of my-baby-is-better-than-yours competition happens everywhere you go. And really, who wants to admit their 9-month-old can say six words, yet can’t seem to figure out something as simple as learning to stick to a night time routine? Those kind of babies will never make the waiting list for that prestigious preschool across town, surely. I can totally see why the competitive moms are claiming their baby sleeps through the night from the get-go. I’m sure there are other theories out there, and someday, when I’m a little more alert and well-rested, I’ll research them. But for the love of Pete, if your baby sleeps all night — be thankful and enjoy your Z’s — just DON’T go around bragging to every mom you see. It might send her right over the edge. On the flip side, now that I understand the science and psychology behind this “phenomenon” of all-night-sleeping babies, it really does make me feel a little bit better. Well, that, and the fact that my baby just turned one, so I know that sleep — sweet, consistent, drool-inducing sleep — is just around the corner. **Need practical baby sleep advice? Check out this proven guide to help your baby sleep – in less than 3 weeks. 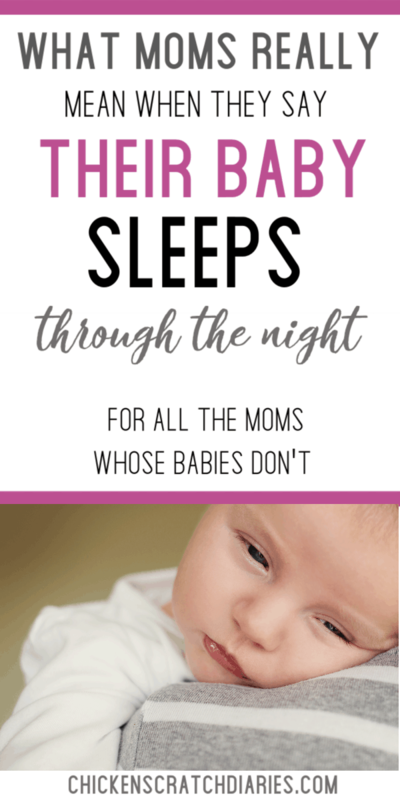 And for tips on night weanings (how to do so safely and when to know if your baby is even ready)- here is a NEW step-by-step guide to walk you through the process. This is awesome! I have four kids, too. The older three didn’t sleep through the night until they were at least 9 months. My fourth still doesn’t! I can’t stand seeing instagrams saying, “my baby finally slept through the night last night!”…at 3 months old. Thanks for reading June! 4 kids is an awesome number. 🙂 I do have to say on the upside (and you can probably relate), I have learned how to survive on very little sleep! I sort of feel like my superpower is staying awake all day. Babies and kids are all so different aren’t they? Thanks for stopping by Ashley! Oh my goodness, this is so relevant in my life right now. I have a really bad sleeper, too. He’s almost 9 months and we had a week of him sleeping through the night. A single week. Back in April. And when I say through the night, I mean from like 11 until 4. 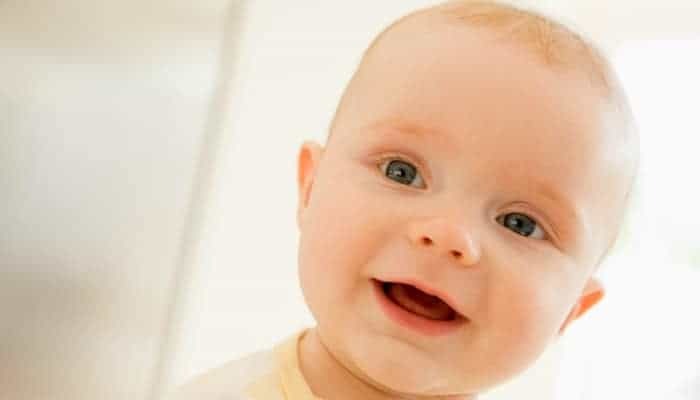 I get so frustrated, too, when I read some social media post with a baby that sleeps “12 hours a night!” I think you’re right – those babies are genetically engineered differently. 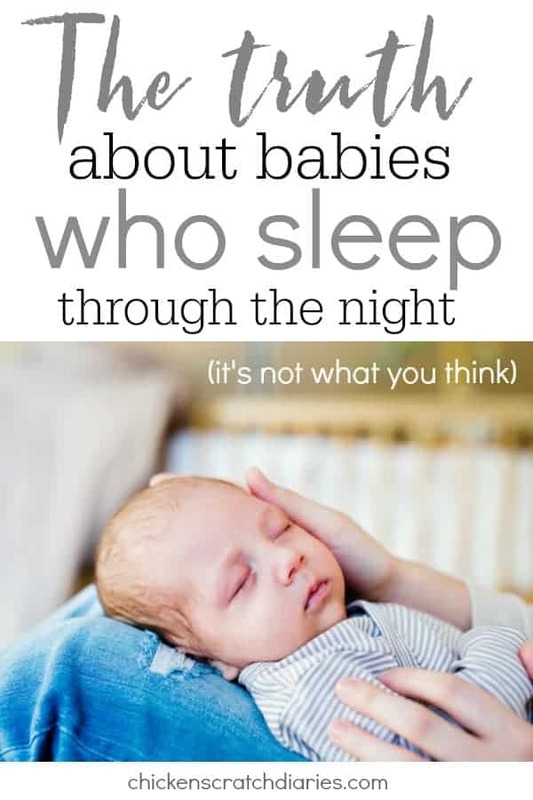 I also find that I get upset when someone complains that their baby had a bad night: “My little one only slept 9 hours last night. It was the WORST.” Nah, bro, that definitely wasn’t the worst. Maybe that one week in April can carry you through the next few months! 😉 Sleepless moms, unite! It really is amazing how we muddle through somehow. Best of luck for some gooood sleep soon, Eryn. My babies have all slept for long stretches from an early age (I have a fairly large storage capacity) but if things were different this knowledge would give me comfort that I wasn’t doing anything wrong but doing everything right to successfully feed my baby. Hey Sarah, this is great information! I suspected something like this with my babies, as they were all breastfed and wanted to nurse frequently at night time. We made it through somehow! Thanks for stopping by! Although your article may be good to read when someone has a baby that doesn’t sleep, it’s kind of insulting for parents whose kids sleep. Yes, my baby started sleeping all night since she was 6 weeks. However we stopped it because we wanted to stimulate milk supply. But by 4 and a half, maybe 5 months she’s been sleeping all night long. From 8pm to 7 am. I didn’t like to read that you would think I’m a lying. She sleeps 2 to 3 naps during the day and then she sleeps at night. There’s no lying, no genetic engineering, no deafness. Just a baby that sleeps. No, I don’t brag about it. But I answer truthfully when someone asks “how are the nights”. They’re great. You hit the nail on the head: babies are unique! I don’t think there is a guaranteed, one-size-fits-all solution. There are too many factors at play and temperament does play a pretty big role in my opinion. I wish you the best with #5, that’s so exciting!! My son is 3 years old and STILL DOESN’T sleep through the night!!!! Yes, 3 years old… how do you think I feel lol and my 2 month old sleeps a bit better atleast, he sleeps every 3 hours before feeding him again. But with my oldest, I would wake up every hour… this went on until he was almost 2… now he sleeps at least 5 hours straight then wakes up and comes into our room then sleeps for the rest of the night.. well tries to… yup my kids are horrible sleepers… so when mom’s say there kids sleep through the night.. you can imagine my face…???? I can assure you that you’re NOT doing it wrong and it WILL absolutely get better. This lack of sleep thing will be a distant memory someday! You will actually miss those midnight snuggles even. 🙂 If there was a perfect formula for getting babies to sleep (or for parenting in general), we would all be doing it with 100% results every time, right? 😉 Hang in there mama! I feel like it’s genetic. My mom said all four of her kids slept 3-4 hours at night and it slowly increased to 10-12 at six months. My son has been the same way as well as my niece and nephew. Of course I say this with only one child….I guess we’ll see how my next couple of children sleep. You may be onto something there Erin! My baby is 6 months old and doesn’t sleep thru the night either but I don’t blame him really, he’s had bronchiolitis for at least a month now and wakes up often coughing so bad he sometimes throws up ???? Luckily though my husband and I alternate nights so at least one of us gets a full night sleep every other night! Hopefully he will get better soon and we will all get some rest! ???? Poor baby! I do hope he gets over the bronchiolitis, that is nasty stuff. Prayers for you & yours! anyway, it doesn’t matter, I learned to enjoy the nights when he doesn’t wake up so often. It definitely makes you appreciate sleep when you DO get it, you’re right Gaby! You’re right, there should not be judging on either side 🙂 It’s really funny to me how serious people are taking this post! You really don’t have to defend your child’s sleep habits to me, promise! 😉 I am happy for anyone who successfully cracked the sleep code. There’s definitely things I would try differently if I had a do-over. (I think?) LOL. Thank you so much for writing this! It’s so nice to not feel alone, while everyone around me with babies seems so well rested! It can be so challenging with babies who take their good ol’ time getting to sleeping through the night. Mama mia! Thank you again! It is challenging for sure! Probably one of THE biggest challenges of the baby years, because it affects so many aspects of our life! But it really does pass quickly- more quickly than we realize at the time. You will get through it! Love to you, mama! Omg yes. My oldest and youngest slept thru the night by 3 months. My middle woke up 5 times a night until she was 14 months old. It has nothing to do with anything except the individual child. that’s pretty much the conclusion I reached too! My eldest slept from 8-8 from around 6 weeks old, the midwife even had me wake him in the hospital the night he was born because he slept for 8 hours. It was amazing, then #2 arrived. He would only sleep in 2 hour intervals. . . for 3 years. I’m pretty sure he was making up for the beautiful rest we got with his brother haha. Now when my boys are 17 and 15 we are expecting our 3rd child in 3 months time, and lack of sleep is the one thing I am really worried about. Fingers crossed this one takes after #1. I will hope along with you for a good sleeper Natasha 🙂 Check out the Baby Sleep Made Simple site if all else fails! Best article I’ve read in a long time! STTN? What is that? My 19 month old still wakes up ALL the time! 🙂 🙂 Thanks for stopping by Laurin! This was so great to read! I thought we had a “good” sleeper on my third but looks like she decided otherwise. All my kids took around one year or longer to sleep through the night. I also can’t help but laugh when someone asks if she sleeps through the night lol. I’m lucky enough to be able to stay at home so there isn’t much riding on a good night of sleep. Lol I love this post. I have a four year old boy who still doesn’t sleep through the night and a 18 month old that does half the time. I also have soooo many friends that say their kids were sleep trained by the time they hit one oh how I wish I could just give her my kids for the week and see how she sleeps train them. 😉 Kids are so unique, I’ve learned four kids later. This too shall pass, I promise, though! This made me laugh and feel for my sleep deprived friends! Both my kids have slept through the night since the day we brought them home BUT we co-sleep and i’m pretty sure that’s why. Downside to that: my oldest is 6 and youngest is 3 and they’re both still in our room/bed. 😐 people said it would happen but i didnt care because i was not willing to be sleep deprived. I figure this wont last forever and snuggling my little toddler and holding my 6 year olds hand (she sleeps on a matress on the floor next to me) as they fall asleep will soon end. But i have been well rested these last 6 years lol. My daughter slept 20 hours a day as a newborn, I remember asking the dr if that was ok. She slept through the night at 5 weeks (6 hours straight). I loved her for it! I never mean to brag but I am weirdly proud of her for it. My son is 18 months and only slept through the night once, The night after he was born!!! BUT HEY!! They grow up so until he does decide to sleep through I’ll just embrace the getting up at night.. Oh and the problem is probably because I tuck him into bed with me.. But I am all he has (dead beat dad since before birth) and he is pretty much my world… At least I haven’t heard of a 16 year old who doesn’t sleep through so there is HOPE! Thanks for great read! That is the BEST perspective to have Nicole. They’re only little for a short time. It might be hard at the time, but soon it will be a distant memory.